Robert Navarro & Associates Engineering, Inc.
Western Refining wanted to transfer products from the south to the north side of the plant, but Trowbridge Street was an obstacle. A pipe support bridge offered significant cost savings over a tunnel project and would make regular inspections more convenient. The Continental® multipurpose structure meets all of the necessary engineering requirements, including the ability to withstand El Paso’s seasonally strong winds. Lighted pedestrian walkways are located on the outside of the structure, with the pipe galley running between. Corrugated steel is used for the curved roofing above the walkways and also utilized as paneling to enclose the pipe galley. The walkway’s metal decking is powder coated with a non-skid surface applied for sure footing. JCF Bridge & Concrete assembled the bridge and installed the corrugated roofing and side panels for the pipe galley while the structure was on the ground. 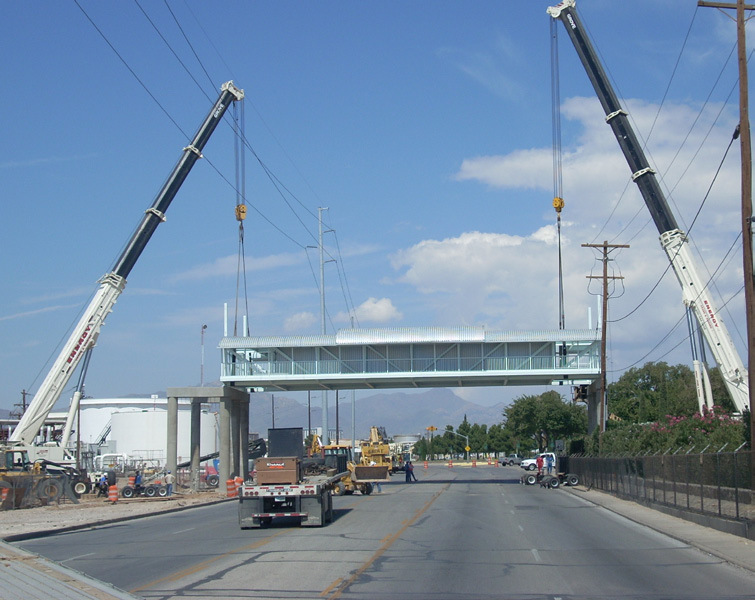 Using two cranes, the large structure was lifted onto the concrete piers, secured and installed in six hours.